Want to end the American shooting epidemic? A crucial factor about the Florida killer: his family had to move out of the school district because they couldn’t afford the rent. Resentment yields anger. Not every poor kid becomes a killer think Bill Clinton but there will be one. Inequality kills. A student of statistics my son was surprised by his regression analysis of gun ownership per capita in each nation versus homicides. 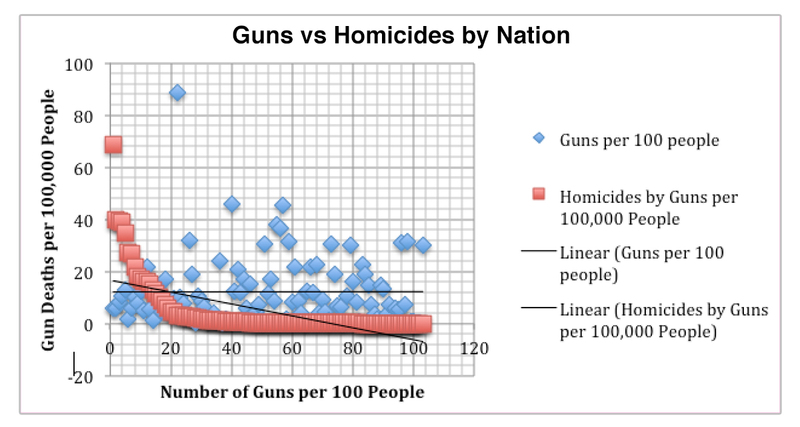 In fact, “the correlation coefficient was -0.105871699.” That is, by a small amount, more guns meant fewer homicides. So what DID prove a strong correlation? Homicides versus the “GINI” coefficient. GINI is the measure of income inequality in a nation. I’ve just returned from the nation with the widest gun ownership in the world, Switzerland, which has vanishingly few homicides although almost all men 18-35, due to ancient military tradition, must keep weapons in their home (many fully automatic). The nation with the same population as Switzerland, Honduras, has the world’s highest homicide rate yet Honduras outlaws personal gun ownership. Exactly. Want to end gun violence? End violent inequality. It’s also a listing of the world’s most economically unequal nations. After the US, here is the list of highest per capita gun ownership: Switzerland, Finland, Sweden, Norway, France, Germany Austria, Iceland all nations with tiny small homicide rates and very low GINI scores. Iceland, where a huge one-third of households have guns, is the most economically equal society on the planet with a homicide rate of ZERO. As a journalist, you will have to take these facts from my cold, dead hand.